ImTOO YouTube HD Video Downloader is an excellent YouTube HD downloader and accelerator which can speed up video playback and video downloading, and fast download High Definition YouTube videos in resolution of 1080P or 720P and Standard Definition videos. Besides as a YouTube HD video downloader and accelerator, it can also work as an Internet Explorer and an FLV video player. You can search videos from YouTube, play and download YouTube videos with accelerated speed within the application. Batch downloading is also supported to boost the performance. With this amazing program, you can easily download High Definition YouTube videos in resolution of 1080p or 720p and Standard Definition YouTube videos in high speed and great quality. Embedded with a built-in web browser, you can logo on YouTube.com directly and watch videos within the application. 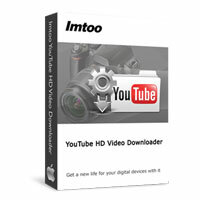 ImTOO YouTube HD Video Downloader provides several convenient ways to start downloading HD YouTube videos, directly when viewing videos or by giving a correct URL of the video to initiate the downloading task. Batch downloading tasks can be proceeded simultaneously to promote the efficiency. You can set max simultaneous downloading numbers to gain better performance. - Built-in web browser to visit YouTube.com directly and watch videos easily. Make a selection on resolutions to decide downloading YouTube HD or SD videos. - Thumbnail view on downloading file list, you can have a more straightforward preview of downloaded videos. - Proxy server configuration is enabled to set up IP addresses and ports to satisfy different demands on network. - Automatically start previous unfinished tasks after launching the application. - System Power Management Options prevents standby/hibernation when connecting to mains or using battery. - Auto-exit the application, shut down, hibernate, stand by the computer, or do nothing after the YouTube HD downloading tasks are done. - Multi-lingual interfaces are offered in language of English, French, Italian, Spanish, German, Japanese, Simplified or Traditional Chinese.